Angelo Brotto graduated from the Academy of Fine Arts in Venice in 1941. The same year, he received a large order from the Ministry of Foreign Affairs to make frescoes in Montenegro. He participated in many biennials and his creations are quickly celebrated by numerous exhibitions. Specialized in working with glass, he worked primarily with the firm Esperia, for which he designed many lamps. 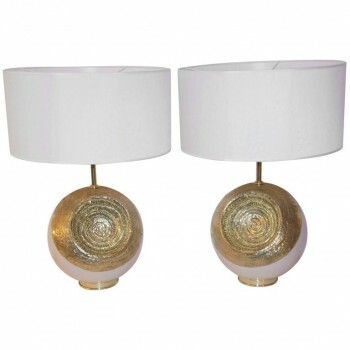 Angelo Brotto, Pair of lamps, Gilded bronze forming a shell design Snail and beige lacquer, Signed Brotto, Esperia edition, circa 2000, Italy. 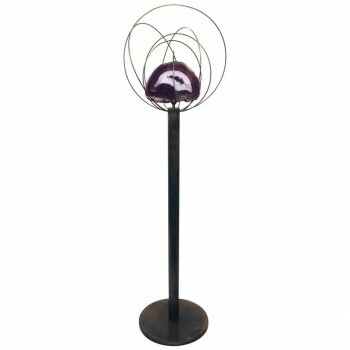 Measures: Height 80 cm, Diameter with lampshade 55 cm, Diameter without shade: 35 cm. 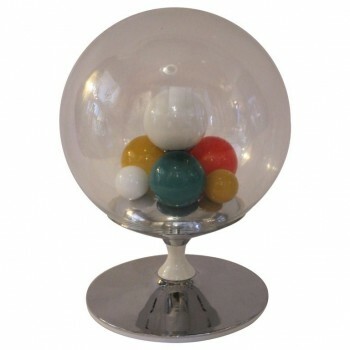 Angelo Brotto, table lamp, metal and glass, enamelled and chromed metal, transparent blown and colored glass balls, Esperia production, circa 1965, Italy. Height: 50 cm, diameter: 30 cm. 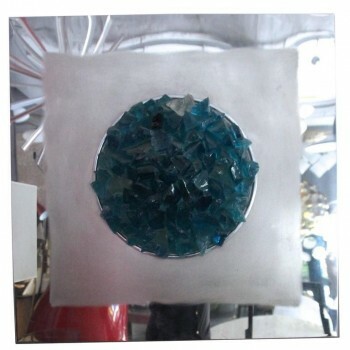 Angelo Brotto, "Oceano" luminous panel made of steel and stainless steel, glass of Murano. Production Esperia, circa 1974, Italy. Measures: Height 80 cm, width 80 cm, depth 12 cm. Angelo Brotto, Floor lamp, Polished stone and brass, Circa 1970, Italy. Measures: Height 170 cm, diameter 54 cm. 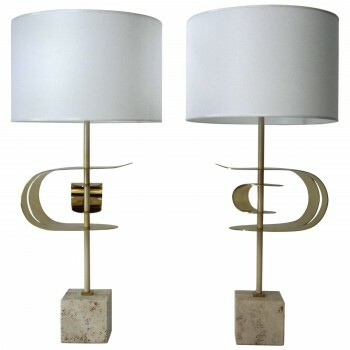 Angelo Brotto, Pair of lamps, Esperie label, Golden brass, lacquered metal and foot travertine, Esperia edition, circa 2000, Italy. Height: 84 cm, width 12 cm, depth: 13 cm. Angelo Brotto, luster, Esperia edition, Circa 1970, Italy. 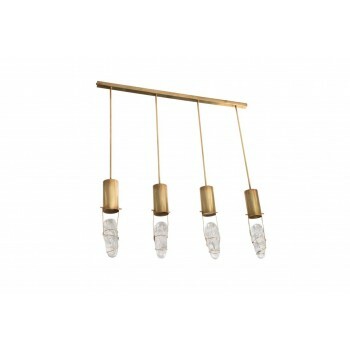 Angelo Brotto, Chandelier, Esperia edition, Opaline, lacquered steel and gilt brass, Circa 1970, Italy. Measures: Height: 150 cm, diameter: 35 cm. Chandelier in the style of Angelo Brotto, Edited by Esperia, Gilted bronze and glass, Circa 1970, Italy. Measures: Height: 78 cm, diameter: 40 cm. Pair of floor lamps by Angelo Brotto, Circa 1970, Italy. Pair of floor lamps by Angelo BROTTO, Gilt brass and glass, Circa 1970, Italy. Measures: Height: 130 cm. 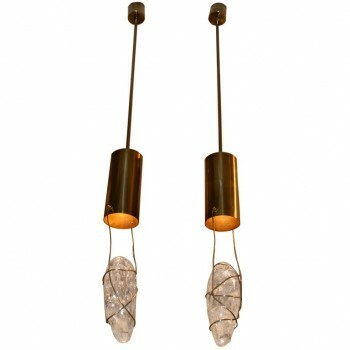 Pendants by Angelo Brotto, four glass lights, Edition Esperia, gold brass and glass, circa 1990, Italy. Dimensions: Height 130 cm, length 110 cm, diameter of the lamp 11 cm.